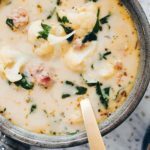 We are entering the thick of winter here in Central Oregon, and we can’t help but continue to make all the soups, casseroles and all around cozy foods. 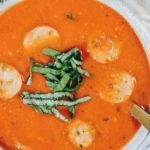 This Paleo tomato basil soup with sausage is a little bit of a spicier twist on traditional tomato soup. A lot of times people think that they can’t have creamy goodness eating dairy-free, but that way of thinking couldn’t be more wrong! 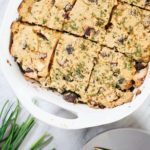 We love making creamy, indulgent and delicious recipes without dairy. 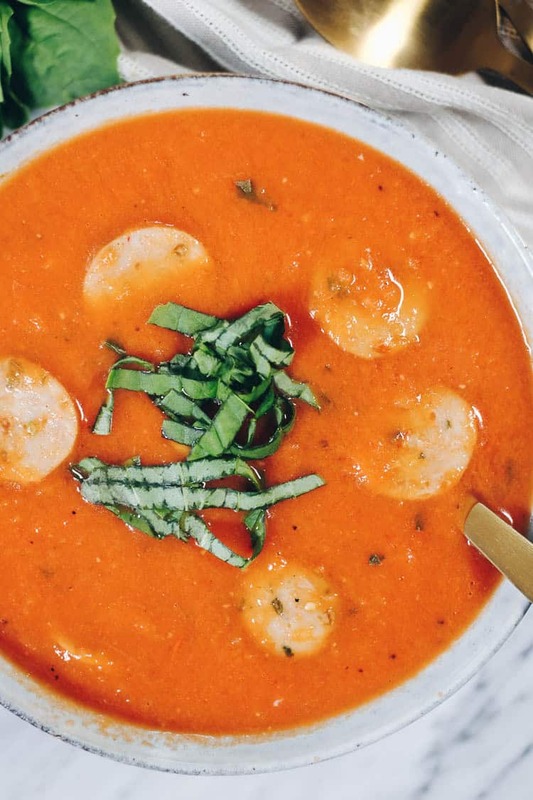 For this Paleo tomato basil soup, we used coconut milk to add that extra bit of creaminess. It helps to balance out the spicy flavors we added. 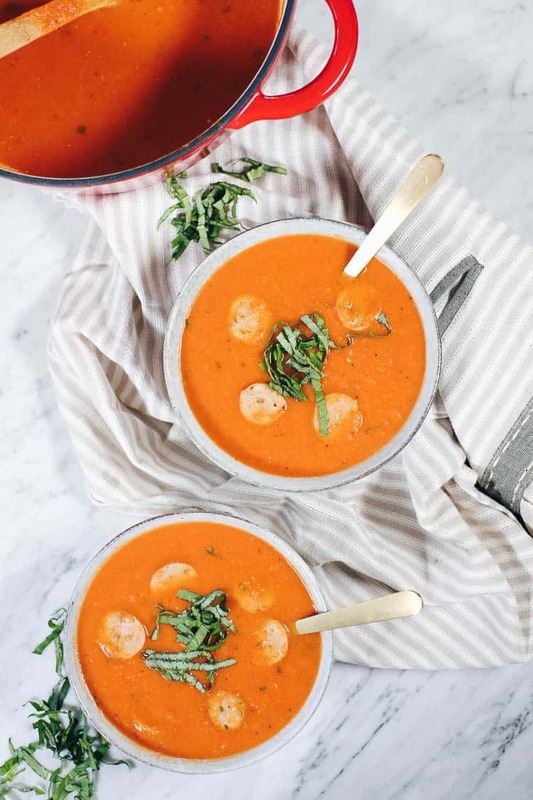 Ok, I have to admit that before I decided to change my health story and start living a vibrant life, one of my favorite go-to’s was Campbell’s tomato soup – the kind with the rice in it. But here’s the thing…it wasn’t that good and I was never full after eating it. So, in addition to making a real food Paleo tomato basil soup that is WAY more flavorful, we also decided to throw some Italian Sausage in. You can count on it being the kind of soup you can enjoy AND feel satisfied after eating. 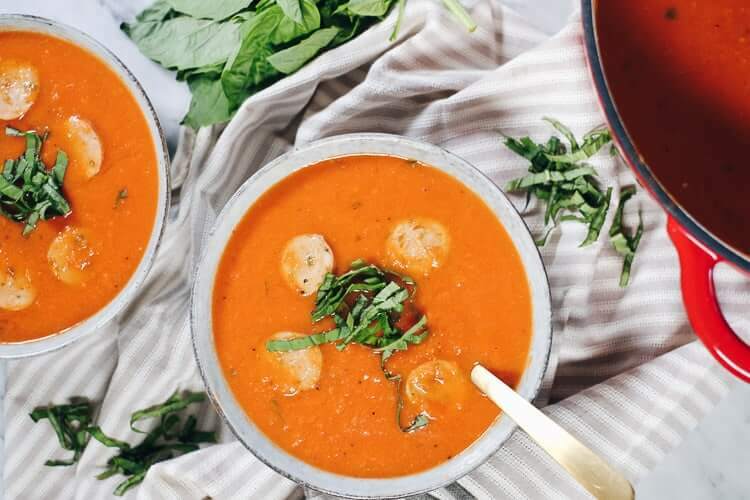 We also added a bit of hot sauce to this Paleo tomato basil soup, which paired with a spicy Italian sausage can result in a little bit of kick. So, while we really love this spicy twist, feel free to modify to suit your own tastes. You can ditch the hot sauce all together, use less or more, and then get an Italian sausage that is not only good quality but in line with your tolerance for spice. 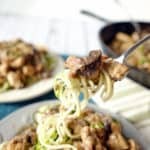 Looking for a light, yet satisfying meal you can make in just over 30 minutes? 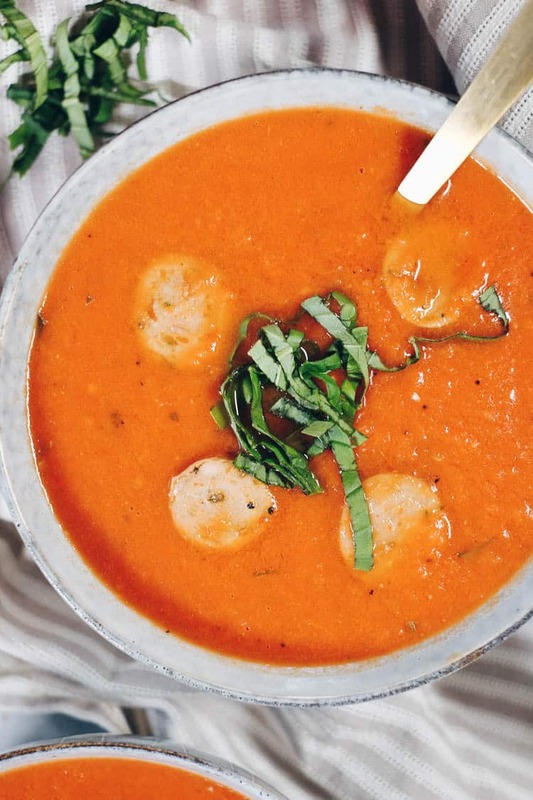 Make this Paleo tomato basil soup with sausage. 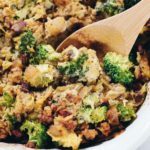 It’s hearty and made with all real food ingredients. 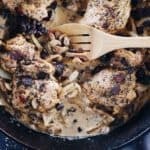 You will love the spicy twist and added protein. Let us know how it goes by leaving a comment below. Also, take a photo and tag us on Instagram @realsimplegood, so we can check it out! 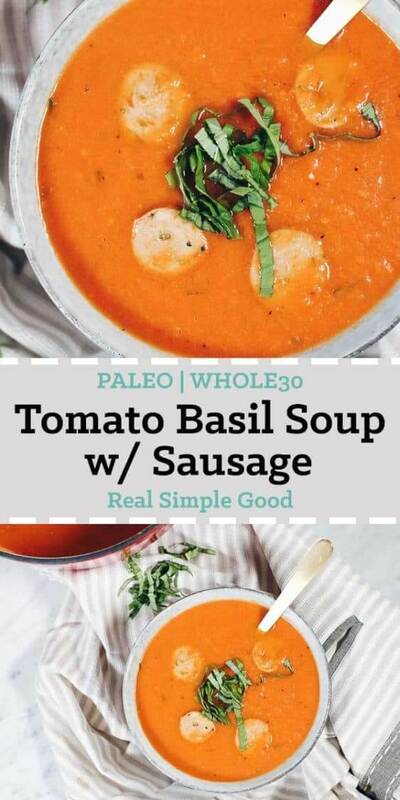 This Whole30 Paleo tomato basil soup with sausage is a bit of a spicier twist on traditional tomato soup with added protein and is quick and easy to make! Chop onion, garlic, basil and sausage as noted. In a stockpot or dutch oven over medium heat, add avocado oil. Once hot add the onion and sauté until softened, stirring often, about 5-6 minutes. Add the garlic and sauté for 1-2 minutes. Add the tomato paste, canned tomatoes, hot sauce, chicken broth, coconut milk and 1/2 of the chopped basil. Season with a pinch of salt and pepper (about 1/2 tsp each). Cook until the ingredients are warmed through, stirring occasionally, about 6-7 minutes. Using an immersion blender, puree the soup until smooth. Alternatively, you can transfer the contents to a blender (carefully) and puree in the blender. Add the sausage slices. Cook soup until the sausage is warmed through, about 5-6 minutes. Taste and season with additional salt and pepper as desired. Serve and garnish with chopped basil. 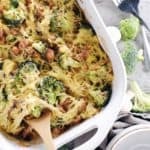 I made this recipe today and it was delicious! I substituted the sausage with chicken sausage because it’s free of nitrates. I was just curious about the serving sizes though. The recipe says 4 servings, is that accurate? How many ounces/grams would a serving be then? Thanks! We didn’t measure out the servings, but you should get 4-6 servings out of this depending on your desired serving size. 28 oz diced tomatoes total? Or, 2 28 oz cans? Super excited to try. Just want to make sure I get the ingredients accurate. So so good! I’ve made it twice in the last few weeks. Perfect for the late summer early winter weather in Colorado. Thank you so much! We haven’t personally frozen this soup but it should freeze just fine. I just made this for lunch. So good! Thanks!